Enjoy the outdoors in a new way at Reflection Bay or Westin Lake Las Vegas! Float in a kayak or enjoy a stand up Paddleboard on the water while the sun sets the sky on fire, the full moon rises, and the stars twinkle. 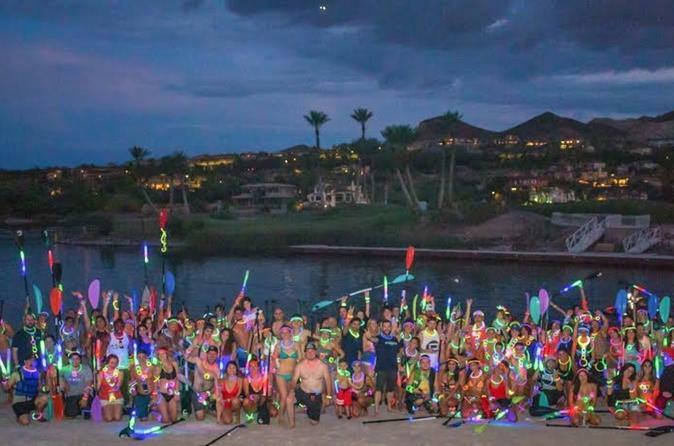 Our night begins with a pre game party at Reflection Bay beach in which we supply you with LED glow supplies to light up the lake as we paddle to our destination. At the beach we have a tiki bar with food and drinks along with numerous different beach games. Be sure to come early to enjoy the beach along with our bon fires. Our paddle will begin when the sky is dark. Once we hit the water it will take approximately 30-45 minutes to reach our destination in which we will have a floating dock with our own DJ and lights to light up the sky! We will hang out at this destination for 45 minutes and then return to Reflection Bay. Once the paddle has finished we don’t stop the party there, we then then host an after party either on the beach or at the Montelago Village where food and water will be available.